Primera Pagina: Poetry from the Latino Heartland, Scapegoat Press, 2008. 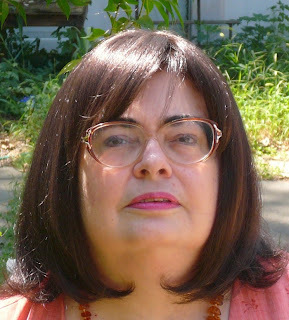 Speaking on behalf of the Latino Writers Collective is Linda Rodriguez, who heads the marketing and publicity of this literary project, but who is also a featured contributor of the anthology. She is founder and coordinator of the annual Kansas City Women Writers Reading Series, and a founding board member of the Writers Place. Her cookbook, The “I Don’t Know How to Cook Mexican” Book (Adams Media) will be published later this year. Her book of poetry, Heart’s Migration, will be published by Tia Chucha Press in Spring 2009. Although Latinos thrive in every part of the U.S., not just along the coasts, it always seems to surprise people that Latinos have a long history in the Midwest. A project like this is an excellent reminder of that relationship, and of how Latinos also contribute to the cultural life of the country’s “heartland.” Can you discuss the genesis and history of this collective and how this project came to be? Can you also speak to the decision not to name an editor? As you mentioned, there have been strong Latino communities in Kansas and Missouri for a hundred years or more, but no one elsewhere seems to know about them. The Latino Writers Collective came about because there were no local Latino writers (and hardly any nationally known Latino writers) giving readings in the area. Two of our members, Jose Faus and Angela Cervantes, came together with the hope of forming a supportive group for Latino writers. The rest of us coalesced around that tiny core. We always had the same mission, articulated at a very early stage—to support each other’s writing efforts, to provide role models and instruction for Latino youth, and to provide an opportunity for the diverse voices of the Latino community to be heard. Early on, we set up the first of what we hoped would be an annual reading series, and while we were still in the throes of trying to do that, we decided we wanted to do the anthology. That series was hugely successful and continues to grow each year, and our first anthology grew out of it. Hence its title, which, like that first year’s series, is Primera Pagina. The work in the anthology, for the most part, went through multiple critiques and editing in which most of the group was involved. At the point of assembling the manuscript, I worked with a couple of the newest members of the Collective on their manuscripts and then copy-edited the English. Xanath Caraza, a native speaker of Spanish and college professor, copy-edited the Spanish. So much of the traditional editor’s work was done collectively that we felt naming an individual editor was not appropriate. It truly is a collective work. Fourteen distinct voices contribute to this anthology, showcasing an impressive range of subject matter and poetic traditions that make it difficult to pin down “poetry from the Midwest.” If anything, it’s interesting to see how a number of the poets bring to the work other landscapes, like Mexico, the Southwest, the East Coast and even Europe, although it’s clear that the Midwest is home, or the home away from home. But is there a sensibility particular to the Latino poet of the Midwest? Given the Collective’s mission, is activism part of that sensibility since a number of pieces in Primera Pagina don’t shy away from politics—race, gender, class, sexuality, religion, language, the war. As far as the existence of a sensibility particular to the Latino poet of the Midwest, Rane Arroyo, the distinguished poet who wrote the preface for the book, speaks to just that issue quite eloquently. I would say, “Yes, there is, and it involves displacement and isolation.” Even in mainstream America, the Midwest is isolated, often gets dismissed as “flyover country.” In Latino communities on the coasts and in the Southwest along the border, there’s much more contact with the communities of origin, whether in the Caribbean or Latin America, and the communities are much closer together creating more density of population. For much of the time the Latino communities have been in Kansas City, Topeka, Wichita, they have been scattered, remote from others who speak their language and know their culture. They have had to adapt to the Anglo culture around them to survive while trying to preserve what they brought with them from Mexico, for that was the country of origin for most of that community until the last part of the 20th century. Now, of course, we have members in the community and in the Collective who come from Colombia, Puerto Rico, El Salvador, the Dominican Republic, as well as Mexico, but that sense of isolation that comes from being a separate cultural group in a part of the country that is itself disvalued and isolated continues, and I think it resonates through much of the poetry in the anthology. Activism is certainly a part of the Collective’s sensibility. Some of us are more active politically than others, some of us are more active in community affairs and organizations than others, but we all carry a strong bias against injustice, cruelty, and violence. It’s hardly any wonder that it seeps into our work. I think the character of the writer does that—if the writing is honest or good. I usually write about love of some kind, have a whole chapbook titled Skin Hunger, but I think even in poems like that who you are and what you believe and care about infuse the work. As a Collective, our activism shows most clearly in our work with young people. We have worked with over 25 organizations and institutions to offer workshops, readings, and other programming for children and youth, and our biggest frustration as a group is how much need we see, how many requests we receive, for this kind of work. There are definite limits on the time we have available to meet these needs because we all have other work to do to put food on the table for ourselves and our families. We joke that we need to find a way to clone ourselves. Andres Rodriguez’s poem “In the Name of the Grandfather” ends with these startling lines: “I will tell that old story again and again,/ I will pour it out full, beyond this now,/ I will use it, for I’m a migrant too, alive/ between two worlds where another, spreading, sings.” It’s an empowering statement, this declaration of agency and visibility. And poetry is the vehicle that propels and sustains that volition. The sentiment is echoed in one of your own entries in the book that ends with the line: “Let me give you wings.” Why is poetry a critical avenue of expression for the Latino artist? Why is the affirmation of a voice essential for survival? "SMALL PRESS SPOTLIGHT: LATINO WRITERS COLLECTIVE" was posted August 22, 2008.